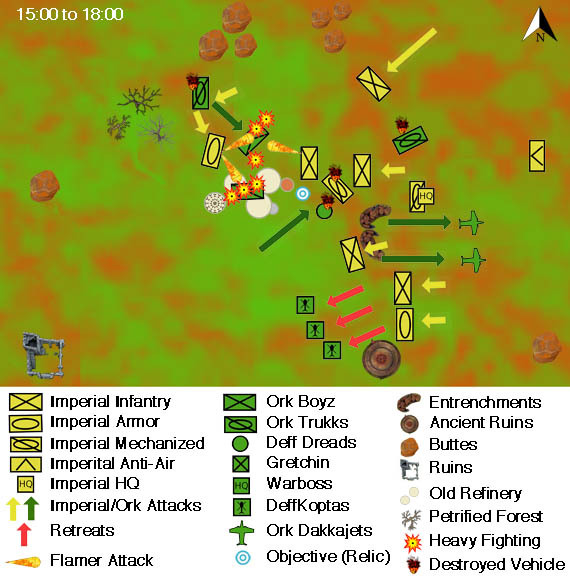 Shocked by the first anti-air fire of the war, the ork DeffKoptas retreat. As he scanned the battlefield, Klein felt his pulse quicken. Although the ork Warboss, supported by walkers, had blunted his mechanized attack up the center, his men were poised on the flank of the ork main assault. The battle was a confused scene of weapons fire, screams, smoke, and blood—but, as the minutes past, Klein saw order begin to take shape. On the left, Captain Velaz’s command began to advance—and, simultaneously, his veteran squads moved on the flank of the same body of xenos. From both sides, fiery streams of holy promethium erupted from the Imperial lines, the densely concentrated body of orks disappearing under a pyre of flame and smoke. The orks’ animalistic roars turn into screams. Special weapons squads, equipped with flamers, proved highly effective against the ork hordes. Two Dakkajets finally arrive on the battlefield, their late appearance having grave consequences for the ork attack. The aircraft immediately target one of the most obvious threats—the veteran squad—and rip it to shreds. 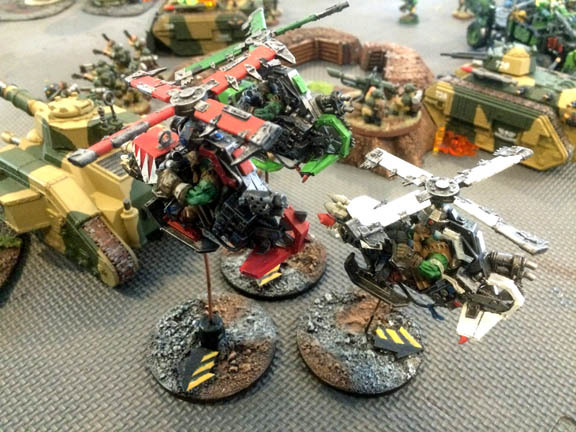 The veterans’ celebration at crushing the orks die … literally. 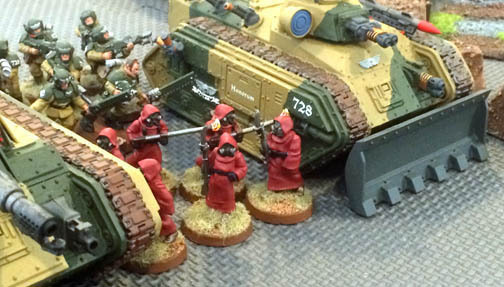 The Rokkit Launchas target the Lemon Russ tank, seeking to further whittle down the “humie” counteratack that is proving so devastating—but their accuracy is normal (in other words, they miss miserably). Once the Warboss and Deff Dread turned toward the center, only a single mob of Boyz stands to oppose the Imperial left flank—and, as the orks look down the barrel of the Imperial armor, they decide to find easier prey. They run for cover in a nearby petrified forest—an unorky (ie. sound) tactical decision. In the center, the Deff Dread fires on the Skitarri but the walker’s flamer runs dry—no damage is done. By the time the walker switches to its auxiliary fuel supply, the Skitarri are on the move—and out of range. On the Imperial right, the ork line is near collapse. A few orks attack to charge the Skitarri but come up short—right in front of the Hellhound. Finally, the DeffKoptas—still unnerved by the Hydra’s fire and the shockingly few orks still on the ground—continue to move toward toward friendlier airspace. It’s all part of a cunning plan … to live through the day. The ork Warboss is dead, and the orks are running out of warriors. All it will take is one last push to ensure an Imperial victory. On the Imperial right flank, the Skitarri and Hellhound target a mob of Boyz charging the Relic and, between them, kill seven and essentially wipe out the unit. With only two orks left, they fail their morale and flee. The ordinance officer finally manages to bring down a bombardment on the remaining Boyz on the Imperial left flank—and kill three of the 10 despite their heavy cover. In the center, every Imperial soldier—including two lascannon teams—target the still-burning but deadly Deff Dread. Alas, the ugly brute’s armor withstands everything thrown at it. It was a miracle, Velaz thought. After four heartbreaking—and terrorizing—defeats, the Imperial line had held. Everywhere he looked, he saw guardsmen advancing. The battle cannons of the Imperial armor were firing almost non-stop, the most glorious sound Velaz had heard in weeks. All he could do was stand on a small knoll and wave men forward. It was a glorious sight—and his heart soared. To his right, he saw a pillar of flame—and realized that a single Deff Dread was holding back the Imperial counterattack. That won’t do, he thought. Not now when victory was in the air. There is little left for the orks to send into battle. On the Imperial right, a single remaining mob of Boyz slinks through the petrified forest in a desperate attempt to position themselves near the Relic—in a vain hope, if there is another turn, that they can rush forward and contest the objective. A few half-hearted shots are fired by a small number of Rokkit Launchas to no effect. The Dakkajets are out of position and maneuver desperately for another attack run. The DeffKoptas realize the game is up. They keep heading south to their airbase. Their morale is shot. The Hellhound commander looks to target the last mob of Boyz, slinking about in the petrified forest. It occurs to him that, if he positions his vehicle “just right,” he also will be in the ork deployment zone. He accelerates to cruising speed, gets behind the Boyz, then spins about to keep his front armor facing them. The inferno cannon fires—and the Boyz are gone. The only remaining threat is the Deff Dread, which still can contest the sole objective on the battlefield. The Lemon Russ tank and two lascannon teams target it, desperate to bring the walker down. Shot after shot strikes the ork mechanism. Bits of armor begin to fly off—and finally the walker’s last hull point is lost. To his right, the ork walker—nearly four meters tall—spewed flame from its steel-framed armatures, engulfing a squad of guardsmen in promethium. But the men’s screams were impossible to hear above the sound of dozens of lascannons and heavy bolters all targeting the monstrosity. As he watched, pieces of metal were ripped away from the smoldering Deff Dread, yet it continued its advance on the Imperial lines. It was alone. The walker had spearheaded the attack, yet its accompanying warriors were long since dead. Why won’t it die? Velaz wondered. A lascannon round struck the walker head-on, and for the first time, the blackened and rusted monstrosity rocked on its legs. Sparks began to cascade down its side. The walker continued forward, but another round smashed into the walker’s side, tearing off a layer of steel and exposing its mechanics. The sparks turned into flames as a promethium storage tank was perforated and, within minutes, the flames engulfed the machine. Still it moved forward. Velaz wondered if anything could stop it. But then the walker took a final step and came to a halt, a huge burning pyre on a battlefield of death. Velaz turned away. It was an indulgence to stop and watch the walker’s death, he thought. His men were advancing, and his duty was to lead them … to victory. He forced himself to turn away from the fire and began following his guardsmen. The dice say there’s a sixth turn, but there aren’t any orks left, except for the Dakkajets that cannot affect the battle and the DeffKoptas, which have no intention of turning back to the carnage. A mighty cheer erupts along the Imperial line. The orks have been repulsed! Imperial Guard: 3 v.p. (hold objective) + 1 v.p. (Linebreaker) + 1 v.p. (Slay the Warlord) = 5 v.p. Finally. A clear victory. After so many defeats, so much death, the xeno horde had been turned back. There is seldom silence on a battlefield. Although the big guns were quiet, Klein could hear the screams of wounded men, the defiant roar of wounded orks, and the sound of lasguns finishing off the wounded xenos. “Sir?” came a voice behind him. Turning, Klein spotted a young orderly at attention, his arm raised in salute. Saluting back, he indicated the young man should speak up. The senior officer nodded, saluted, and waved the orderly away. Turning, Klein looked out over the battlefield. After so many months secretly fearing that Hegira was lost, he thought, maybe—just maybe—there was still hope. Perhaps the tide of battle had turned … the Emperor willing. TheGM: After a draw and three straight defeats, I was beginning to think the Hegira campaign was coming to a close. The loss of Susa City would have been a major blow for the Imperial forces, as the orks would be able to attack the Spaceport—whose loss would cut off reinforcments and almost assuredly doom the moon. Between the Gaffer’s gentle observations that I was repeatedly surrendering the initiative to him (essentially letting him concentrate his forces for a killing blow), and my own “lessons learned” watching myself lose control of recent battles, I had a game plan that called on me to disrupt the ork attack and force the xenos to react to me. It worked. I rushed forward and stopped the orks from seizing the relic and that drew the ork warlord and Deff Dread away from the main ork attack, weakening it significantly. I’ve learned that flamers are my best friend against orks. I had three flamers in all my special weapons squads and one in each normal squad—and my veterans had a heavy flamer and two normal flamers. That was a lot of promethium, and coupled with the infernal cannon of my Hellhound, I charbroiled dozens of orks. Fire literally broke the ork attack. Now the strategic initiative shifts to the Imperium, which will seek to retake the Barad Mine—and move the fight away from Susa City and, hopefully, begin the long slog to free the xeno menace from Hegira. Click here to return to Part 2. Great report GM glad to see you winning a game.